A new perspective on Marketing … The Close Contact Marketing – Broward Leadership Lunch of Entrepreneurs’ Organization South Florida. Today, I had the opportunity and the pleasure to present my perspective on Marketing, during Broward Leadership Lunch of Entrepreneurs’ Organization South Florida. 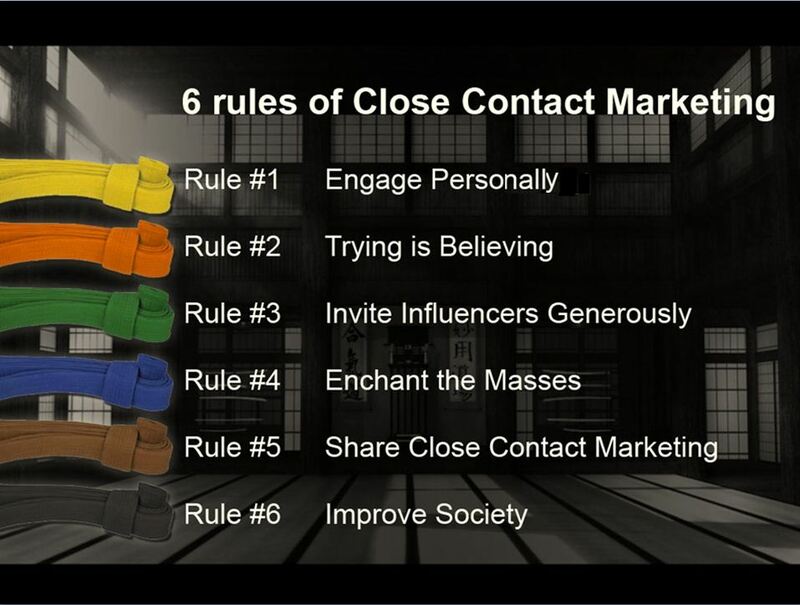 I ‘ve shared The “Close Contact Marketing” that I’ve developed. Close Contact Marketing is based on the following belief: once you convince the consumer, he becomes your best ambassador. Close contact marketing has its roots in eastern values of the martial arts such as karate : respect and direct involvement are part of it. Its six rules are symbolized by belts of the sport that I practice so much. You will find here below the presentation. Are you ready for 2020 ? The world is changing very fast and the impact of new technologies is key on the world of tomorrow and the skill needed tto succeed. In just six years time, the skills you’ll be looking for in star employees will be vastly different from those ideal in today’s workers. As social technologies play a more important role in value creation, skills such as social intelligence and new media literacy, will probably become increasingly important for workers. The infographic below from Top Ten Online Colleges shows which capabilities will be most valued by 2020. Xbox 360, Apple Corp, MTV Games and Harmonix are giving the world new ways to relive the magic of Beatlemania with the launch of “The Beatles™: Rock Band™” (Harmonix/MTV Games) on 09.09.09. Beginning at launch, Xbox 360 will give Beatles fans, rockers and gamers alike the chance to download an exclusive Beatles track to benefit Doctors Without Borders and test their Beatles knowledge with a unique “1 vs 100” experience – only on Xbox 360 and Xbox LIVE. This autumn, Xbox 360 will harness the passion of its more than 20 million Xbox LIVE members for charity. “All You Need Is Love” will be released exclusively on Xbox®360 video game and entertainment system as a downloadable song for “The Beatles: Rock Band” through Xbox LIVE on September 9, 2009 with Apple Corps Ltd, MTV Games, Harmonix and Microsoft proceeds benefitting Doctors Without Borders/Médecins Sans Frontières (MSF). Sir Paul McCartney and Ringo Starr, along with Yoko Ono Lennon and Olivia Harrison personally selected the international emergency medical humanitarian organization created by doctors and journalists in France in 1971 as the beneficiary of the proceeds. The track will be available for 160 Microsoft Points. As if that wasn’t enough, you’ll also be able to fill even more of your entertainment time with music videos, documentaries and movies inspired by the Fab Four on Xbox LIVE. From classic tunes from band members to the best of the Mersey’s music from today and the critically acclaimed documentary, “Imagine: John Lennon,” it’s all there for you at the touch of a button. In addition, “The Beatles: Rock Band” owners will be able to download the full “Abbey Road” album beginning on October 20, along with “Sgt. Pepper’s Lonely Hearts Club Band” and “Rubber Soul” following in November and December respectively. The albums will be available for 1360 Microsoft Points, with individual tracks at 160 Microsoft Points each. Need more ways to prove your love for The Beatles? Then challenge the depths of your knowledge of The Beatles in a unique “1 vs 100 LIVE” episode. Coming on August 29, as an Xbox LIVE Gold member, you’ll get the chance to not only chat live with some of the creative minds behind ”The Beatles: Rock Band,” but also call in to test your knowledge of the band and their music and even win some Microsoft Points for your efforts. Immediately following, fans who can’t get enough can continue the fun with two back-to-back “1 vs 100 Extended Play” episodes full of Beatles trivia. Coming soon, music fans and gamers will also get the chance join the “Fab Four Mystery Tour” – an interactive look at the Beatles and the many twists and turns of their career. The website was created using artwork and animations from the eye-popping intro cinematic for “The Beatles: Rock Band” created by Passion Pictures, that debuted at E3 this year. 6 Success Questions You Need To Ask. Why Gen Z is Approaching Money Differently ? Millennials found the journey to adulthood riddled with obstacles such as stagnating wage growth and uncertain economic conditions. These challenges, combined with other generational circumstances, helped to shape the group’s spending habits and attitudes towards money and debt. Growth Mindset in 1 Picture. What it the difference between Successful People vs. Unsuccessful People ? 5 ways to increase intelligence.